OVCS senior Cori Hutchison (41) looks toward the basket from the high-post, during the Lady Defenders’ loss to Wellston on Tuesday in Gallipolis, Ohio. 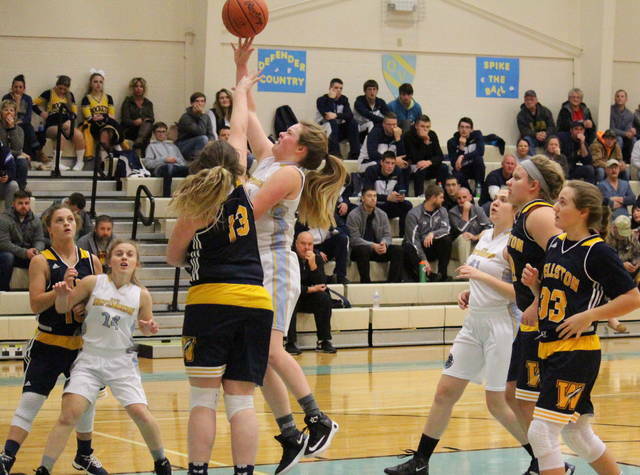 The Ohio Valley Christian girls basketball team suffered a 59-11 setback at the hands of non-conference guest Wellston on Tuesday evening in the Old French City. The Lady Rockets (2-3) took the lead on a three-pointer eight seconds into play and never relinquished it. 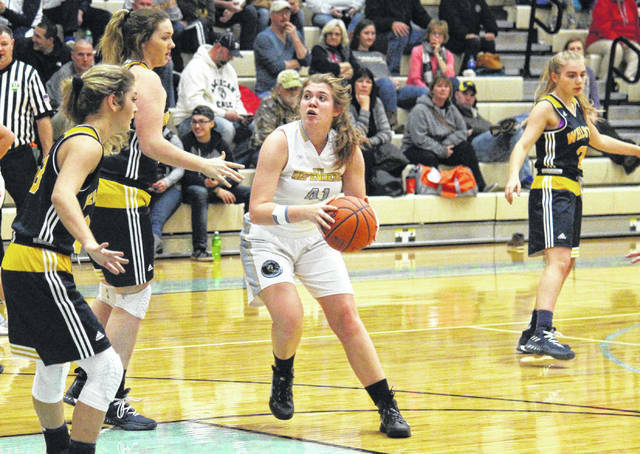 The Lady Defenders (0-5) cut the deficit to one-point with 5:50 left in the opening stanza, but Wellston closed the period with a 7-3 run and a 10-5 run. Ohio Valley Christian was held off the board entirely in the second quarter, as WHS stretched its lead to 30-5 by halftime. The Lady Rockets went on a 21-to-1 run in the third quarter, extending their advantage to 51-6 headed into the finale. After Wellston hit a three-pointer to open the fourth quarter, OVCS scored five straight points, including a trifecta that ended a 22:43 field goal drought. WHS ended the game with five unanswered points, putting the final touches on the 59-11 victory. For the game, the Lady Defenders shot 3-for-30 (10 percent) from the field, including 1-of-8 (12.5 percent) from three-point territory. Wellston, on the other hand, was 25-of-79 (31.6 percent) from the field, including 7-of-31 (22.6 percent) from beyond the arc. From the charity stripe, OVCS was 4-of-15 (26.7 percent) and WHS was 2-of-8 (25 percent). 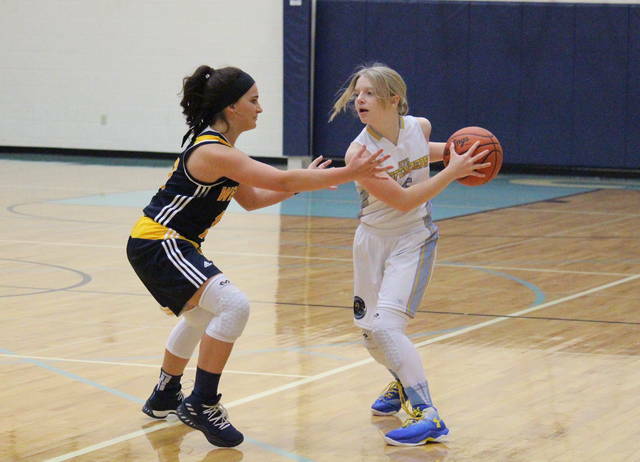 The Lady Rockets held a 50-to-25 rebounding advantage, including 27-to-5 on the offensive glass. Ohio Valley Christian claimed a 4-to-2 edge in blocked shots, while Wellston earned advantages of 12-to-2 in assists and 30-to-4 in steals. WHS won the turnover battle by a 34-to-10 margin. All-11 of the Lady Defenders points came from junior guard Emily Childers, who had a pair of two-pointers and one triple, while going 4-of-5 from the free throw line. Childers and Kristen Durst tied for a team-high with seven rebounds, while Acacia Peck and Yuyan Sun each had an assist in the game. Childers also led the OVCS defense with two steals, while Olivia Neal had a pair of rejections. With six field goals, half of which came from beyond the arc, WHS junior Sydney Mullins led the guests with 15 points. Mya Bouska, Alexis Bouska and Daycee Clemons each had eight points in the win, with Mya dishing out a game-high three assists. WHS junior Tory Doles scored five points and pulled in a game-high 13 rebounds, while Emily Kisor had four points in the triumph. Ashley Compston, Megan Vickers and Emma Jadrnicek each scored three points for the guests, while Lindsay Snyder finished with two markers. 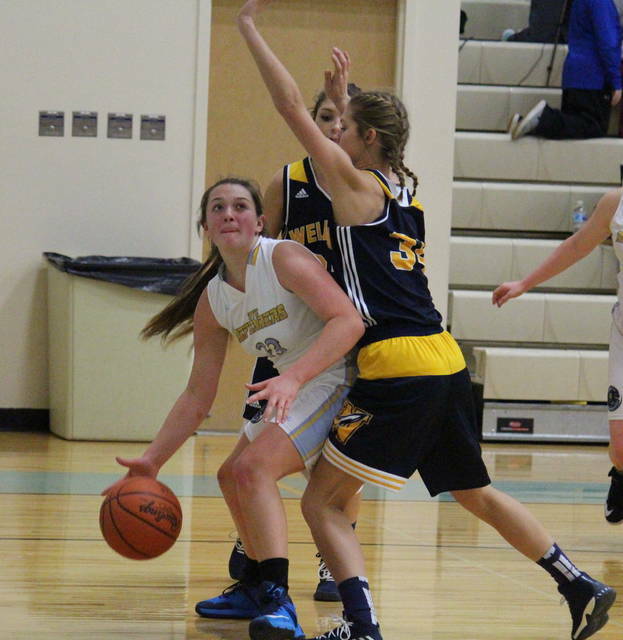 Mullins also led the WHS defense, recording nine steals and one rejection. OVCS — which won’t face Wellston again this winter — returns to the court on Friday when Parkersburg Christian visits Gallipolis.